The Democratic National Committee is vying for the seal of approval from two organizations that are both at the forefront of the Black Lives Matter movement. First, there’s the Black Lives Matter organization itself, which was started by Patrice Cullors, Alicia Garza and Opal Tometi. And then there’s Campaign Zero, which has DeRay Mckesson and others at the helm. Both organizations do important work, but they’re also trying to get the attention of the DNC, and vice versa. On Wednesday, both the DNC and Republican National Committee stated that they would offer both groups the opportunity to participate in a Black Lives Matter town hall, but not a formal debate. According to the Washington Post, both Campaign Zero and the #BlackLivesMatter network received letters from the DNC informing them of their town hall option. The RNC, in a similar letter, also stated that the offer for a town hall was on the table. But now a town hall doesn’t seem to be on the minds of the #BlackLivesMatter organization. On Thursday the organization posted on Twitter that it didn’t want a town hall, but a public debate. It is not enough to poll the presidential candidates on whether or not they think “Black Lives Matter” or “All Lives Matter”—we deserve substantive responses and policy recommendations. We deserve substance and not rhetoric. In fact, we demand it. This last year alone has demonstrated clearly that black lives are under attack—from police violence to the murders of black trans women to economic disenfranchisement and neoliberal policies. It’s time to extend the public conversation beyond the status quo. 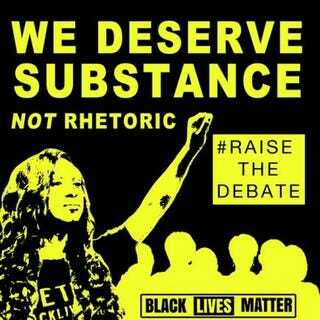 We want to hear candidates debate and offer tangible solutions to the myriad issues impacting black people. Lifting the unfair restriction on the number of debates and supporting a Black Lives Matter presidential debate is a step in the right direction. So where does Mckesson and his organization stand on the idea of a town hall versus a debate? Well, it seems as though he’s courting the DNC and moving full steam ahead to help organize the town halls. He’s already contacted heavy hitters, like Twitter and other corporations, to form partnerships. And according to Mckesson, the RNC has agreed to a public Black Lives Matter forum. In a political climate where both the DNC and RNC have yet to address a lot of the issues that both organizations expect them to address, it’ll be interesting to see which side, if any, the organizations choose.